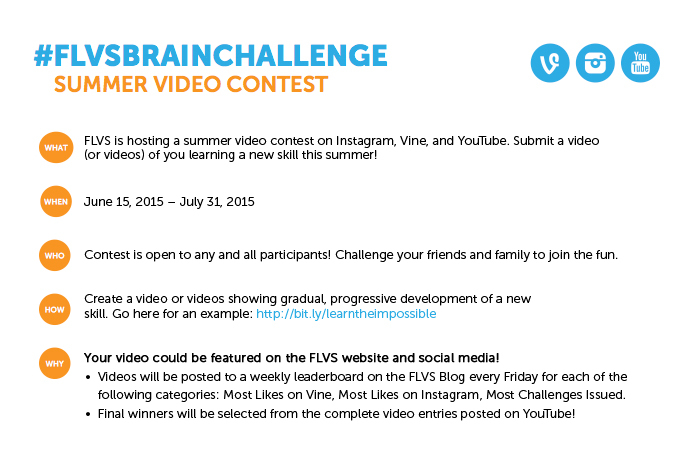 Join the FLVS Summer Brain Challenge! Did you know your brain is constantly forming new neural connections? Scientists have made amazing discoveries about the way our brain cells grow and form new circuits – even into adulthood. The trick to that growth is keeping them engaged by exploring new challenges and concepts. This summer, we are challenging all of our students and their family and friends to show us what new connections your brain can make! We’re hosting a video contest on social media asking you to show us your skills. All you have to do is share a short video of you learning something crazy and cool like this. One winning entry will be selected to win 4 admission tickets to Kennedy Space Center! Complete one or all of the following steps to get involved! Share multiple videos as you get better and better at your skill. Caption with the day/week (e.g., Learning a magic trick, Day 1) and the hashtag #FLVSBrainChallenge. 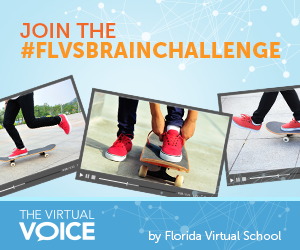 Example: “I challenge [friend’s name] to do the FLVS brain challenge [and learn how to your skill/activity] this summer.” Caption should include: #FLVSBrainChallenge #upnext @yourfriendsusername. 3. Upload a single video to YouTube with separate segments/clips that have been edited together showing the full learning process step by step. Include #FLVSBrainChallenge in the title! Be sure to tag us at @floridavirtualschool on Instagram or @flvs on Vine! Now go ahead. Join the #FLVSBrainChallenge! Need suggestions? 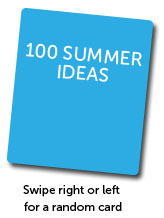 Check out our 100 summer contest idea flash cards! This entry was posted in Educator Edition, Full Time Edition, Homeschool Edition, Student Edition and tagged #FLVSBrainChallenge, Contest, Engineering, Grit, Growth Mindset, Kennedy Space Center, NASA, Neuroplasticity, Neuropsychology, Psychology, Social Media, STEM, Video Contest on June 12, 2015 by Guest Blogger.